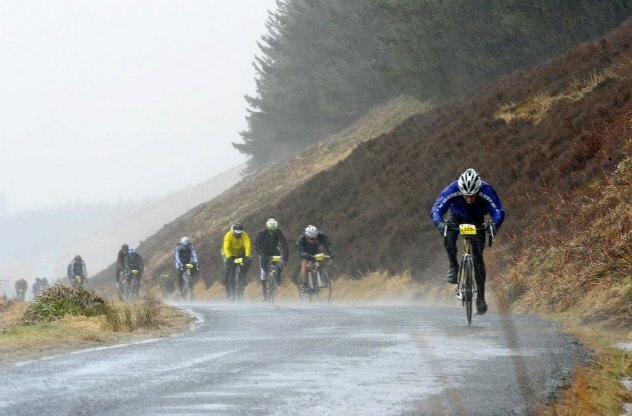 I knew the weather was going to be taxing before we even got the start line on Sunday’s now-legendary Tour o’ the Borders. 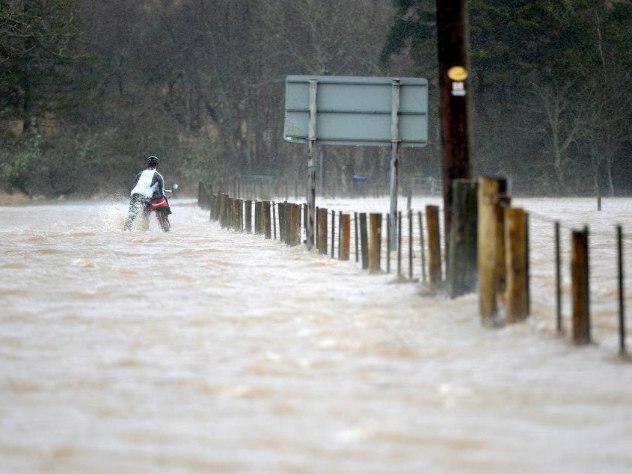 Although there was no question of missing out on a great day on the bike, little did I suspect I would soon be fording a flooding river sweeping knee-deep across the road while the wind conspired to make it almost impossible to stand! The event was based at Peebles High School which provided welcome shelter from the rain, and of course the canteen was doing a roaring trade in coffee and bacon rolls! The organisation of this sportive was first class – it was the work of moments to register, get my pack of goodies and ride essentials- race number and timing chip. No queues! The atmosphere was great (even if, on the course, it’s been suggested there was more of a “blitz spirit”)… we’ll definitely be back next year! Each takes in the long winch over Paddy Slacks (in both directions), the steady grind up Berry Bush, and the lovely Witchy Knowe climb from Kirkhope back over to the Yarrow valley. 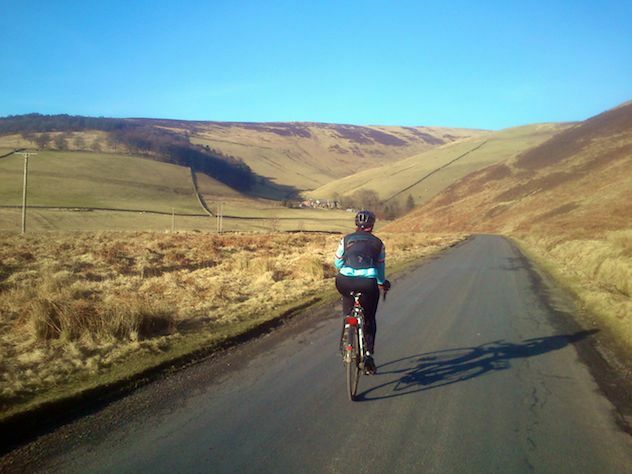 In addition, the long route throws in a couple of climbs between the Ettrick valley and Ashkirk as well as “the Wall” which rears up between Ashkirk and the feed stop at Kirkhope. 9am came around and it was still raining buckets with a fierce wind as we regretfully left the warmth of the canteen. Lined up in the starting paddock together with a group on normal bikes, the wind was already strong enough in the car park that I had to unclip to keep myself upright! Once out on the course, the sheltered few miles to Traquair had me lulled into a false sense of security. When we turned onto Paddy Slacks, the wind was absolutely hammering through the pass accompanied by stinging hail. At this point the Baron started to shine and I picked off an endless stream of riders on the ascent, despite keeping my power low. The most challenging thing was negotiating the huge amount of debris that had been washed onto the road (while trying not to get blown off it! ), as well as the steady stream of abandoning riders coming the other way. I actually had to pedal downhill to the Gordon Arms! Berry Bush was probably the worst headwind of the ride – totally exposed and relentless. It took twenty minutes to climb averaging just 10mph and often had me wishing my inner ring was a bit smaller than 39t! The respite on the descent into the Ettrick valley was delicious. The roads here are absolutely fantastic – narrow and twisting but not so much that you’re worried about what might be coming the other way… just perfect for bikes. However, with only two of the route’s seven climbs completed we came across a marshal flagging riders down to warn of flash-flooding on the long route, and recommending we cut it short. 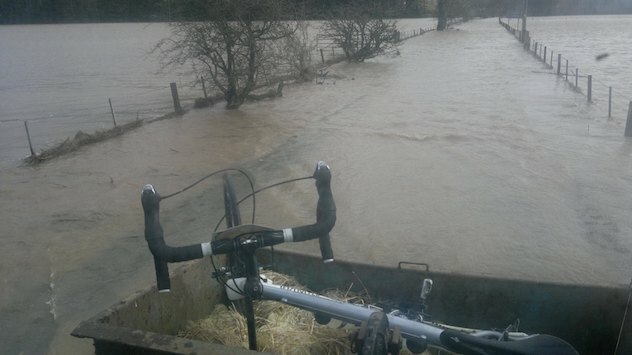 As an audax rider I’m used to a bit of weather and decided to push on, but was admittedly unprepared for the sight of the river Ettrick bursting over its banks and running across the road… did this put paid to my chances of getting a time on the long course? In a past life I used to kayak these rivers for fun (preferably with fewer fences though) so I decided to go for it. Fortunately it wasn’t too deep to stand – it only came up to knee height – but even so I had to use the bike as a rolling tripod to let me lean into the wind and current. 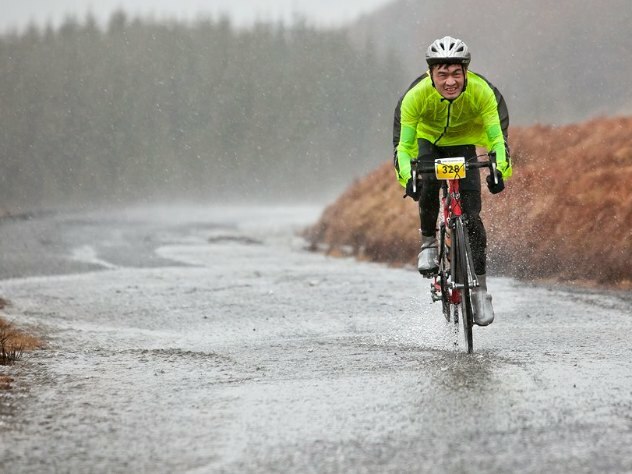 And I’d been thinking that sportives were a soft option – how wrong! As the air temperature wasn’t too low, I warmed up immediately on the other side, and started to enjoy the huge tailwind which swept me around that half of the course. I didn’t bother pedalling above 20mph so needless to say I didn’t do much pedalling until I hit the short climb from Alemoor reservoir, just before the turnoff to Ashkirk. The road to Ashkirk passes over a high moor and was extremely fast despite the conditions – by this time it seemed that I’d been going for about an hour without really having to pedal. From Ashkirk the riding got tough again as I turned back into the wind and hit “the Wall”. This climb was too steep for my 39t inner ring given the conditions, with one ramp at 1:6 (over 15%). Still, the rain was letting up now and this made things much more cheerful. Course highlight – a tree had fallen across the road but the branches were hacked away to allow you to ride underneath (not by the organisers, I’m sure!). Around this time I started to pick up the slower riders who had made it through before the flood, although none of them were going as fast, so I missed out on any sort of draft from here to the finish. The climb up Witchy Knowe was a steady grind and I was finally papped by a photographer at the summit (I haven’t seen any of these photos online though, at all?) before the streaking descent to the Yarrow was testing my brakes. The sun was out now and the ride up to the Gordon Arms was refreshing despite the headwind – I was steadily passing riders from the short course now which kept me motivated. Birling up Paddy Slacks with a gale at your back is fantastic, and the descent seems to go on for an eternity! Last but not least was the return from Traquair to Peebles – I’d hit my stride now and averaged 20mph (the wind was doing funny things) right through to the finish. There were a couple of huge puddles to hammer through – again one had photographers at it, although I haven’t seen any shots from there either. Then it was on to welcome food and dry clothes. Photo courtesy Laid Back Bikes. Don’t miss this event in 2014. 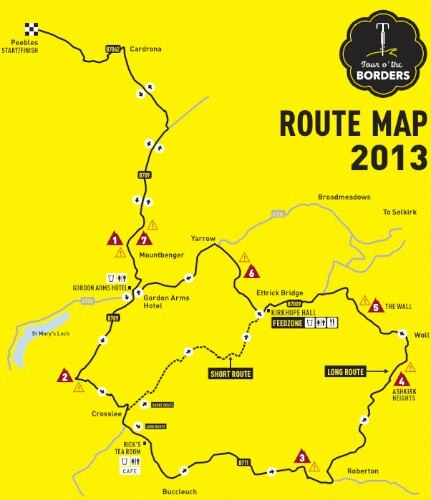 Friendly, well organised, and great roads. It’s going to be fantastic. The new Baron looks very nice Dave. Obviously both aerodynamic and watertight! I notice she was wearing Ultremo tyres, and your new H+Son wheelset. My Archetype wheels built with CXRays (24×28) arrived a few weeks ago from the very friendly and helpful David Hunt. They look fantastic and ride very nicely. 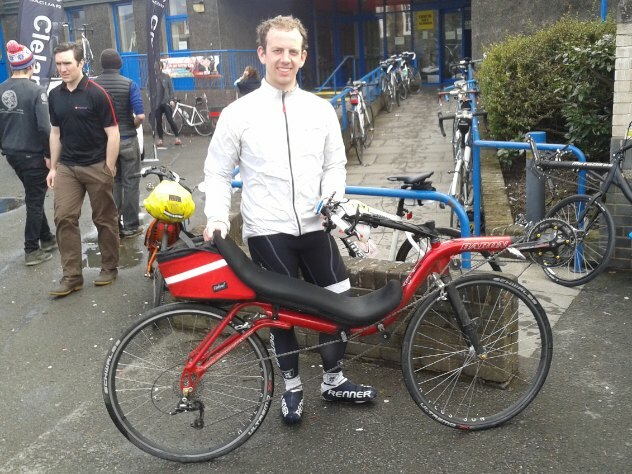 I shall use them for this summer’s LEL (my first audax – help!) and I was planning on riding with GP4000S tyres in 25 front and rear. I’ve used these tyres for some time now, am very happy with how they ride, and have only had one (pinch) puncture (on the front, downhill, at 68km/h!) in over 2 years and a tour around France. However, despite my regular moans, I’m aware that the road surfaces down here in France could be considerably better than what I’m going to encounter on the LEL; even without the incursion of scottish rivers I’ve read your reviews on tyres, and have tried a 26″ Kojak on the front for a while, but I have to say I noticed an immediate difference in rolling resistance, but surprisingly little in terms of comfort over my GP4000S 25s on my unsuspended Metaphysic. However, my question to you, since you know the local roads better than I: do you think the scottish roads will make mincemeat of my GP4000S tyres and shake my bike to bits? I could just about get way with a GP 4Season or Ultremo in 28, but going any bigger (eg Kojaks in 700C) wouldn’t work with my brakes and fork. I don’t want to get paranoid about tyre choice, but I’ve been led to believe I may face a higher ratio of potholes/tarmac to what I’m used to! By the way. What’s the verdict on the High Racer then? Nick, the 25mm GP4000s will be fine on LEL. The roads are not that bad at all, if you asked me to guess I’d say England will probably be worse, because the route goes on third or even fourth-choice back routes whereas in Scotland we don’t have enough roads to have rubbish small ones in reserve, so the ones that are cycled, generally and in the case of LEL, are more important and in fairly good condition. this is towards the end, north of Innerleithen as you approach Edinburgh. As you can see it is quite agreeable. Thanks for your comments Dave, and for that extra photo. Looks MAGNIFICENT. Will be delighted if I get the same weather as in the pic too! I’ll be helping out at the Edinburgh control so hope to see you there! That’d be brilliant! Be great to meet the face behind the words. Mind you, I’ll probably be demented, staggering and speechless by that point! I’ll look out for you though. Just found this after finally riding the long route yesterday. Good account of what has gone down as an epic day. We cut the ride short in 2013 at the request of a marshall after huddling in the caravan feed station for 20 minutes. Been meaning to do the whole route ever since. BTW I was the guy with my helmet on backwards at the start. Thankfully someone told me before I started. It was a new helmet and I was more concerned with finding my mate and staying out of the rain!